The 2012 Southern California Tionól will take place over the weekend of November 9, 10 & 11, 2012. We are delighted this year to welcome two exquisite pipers - New Yorker Jerry O'Sullivan and local boy Patrick D'Arcy. At the reedmaking table we're delighted to welcome back our own local reed maestro Michael O'Donovan. Pipemaker David Quinn, I'm told, may even make an apearance! This years event will be held in the McKeagney residence in the beautiful Spanish Mission town of San Juan Capistrano. Friday will be the usual meet and greet/session. Classes will be held during the day on Saturday and Sunday with a concert on the Saturday evening at a local community hall. Concert Only: $15 in advance, $20 suggested donation at the door. Your skill level i.e. beginner, intermediate or advanced (please be modest). Patrick Dinner Concert Session & Party. Please BYOB! 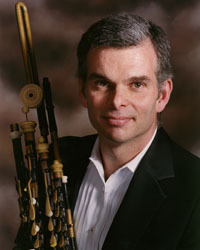 Jerry O’Sullivan has been widely hailed as America’s premier uilleann piper. His reputation for technical and melodic mastery of the instrument, an Irish bagpipe known for its subtlety and expression, is unsurpassed in the United States, and is demanding considerable attention overseas. Jerry is also widely recorded on the tin whistle, the low whistle, the Highland Pipes and the Scottish smallpipes. Jerry has appeared on more than 90 albums and has performed or recorded with artists such as The Boston Pops, Don Henley, Paul Winter, James Galway, Dolly Parton, The Colorado Symphony Orchestra, The Nashville Symphony Orchestra, Eileen Ivers, and many others. 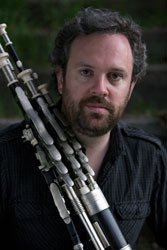 He was a featured soloist on Paul Winter’s GRAMMY winning album, Celtic Solstice (Living Music, 1999). His first two solo albums, The Gift (Shanachie,1998), andThe Invasion (Green Linnet, 1987) have both received critical acclaim, quickly finding their way to the top of a number of “best albums of the year” lists. Jerry has released a solo album, O’Sullivan Meets O’Farrell (Jerry O’Sullivan Music, 2005), which features music from the 200 year old O’Farrell tutor and tune collections. Most recently he has released the much anticipated O’Sullivan Meets O’Farrell (Volume II.) ( Jerry O’Sullivan Music 2010.) Jerry has also recorded a number of film soundtracks including From Shore to Shore, The Long Journey Home, Far and Away, Africans in America, and Out of Ireland, and has appeared on numerous television commercials. Jerry has toured extensively in the United States and Europe and has even played as far afield as Japan and Israel. He has been a featured performer and instructor in numerous Folk Festivals, including: the Smithsonian Folklife Festival, the Milwaukee Irish Festival, the Catskills Irish Arts Week in East Durham, Boston’s Gaelic Roots Festival, the Philadelphia Folk Festival, the National Council for Traditional Arts National Folk Festival, and the Swannanoa Gathering in Asheville, North Carolina. He has performed at such reputable venues as New York’s Lincoln Center, St. Patrick’s Cathedral, and on the mall in Washington D.C. His symphonic concerts have included selections from John Williams Far and Away (performed and recorded with the Boston Pops),O’Sullivan’s March from Rob Roy, Main Title Theme from Braveheart(both performed and recorded with the Boston Pops) Patrick Cassidy’s The Famine Symphony (performed at the world debut at St. Patrick’s Cathedral), Paul Winter’s Pipes Peace (performed with the Colorado Symphony Orchestra), and excerpts from Titanic (performed with the Nashville Symphony Orchestra). In 2007 he was honored to participate in the Dedication of the new Na Piobairi Uilleann (NPU) headquarters in Dublin. More recently he was a guest performer at the 2009 William Kennedy Music Festival in Armagh and was invited to participate at the 2010 Annual Willy Clancy Summer School in Miltown-Malbay, Ireland. Following that was invited back as a guest instructor and performer at the Celtic Irish Arts Week in East Durham, New York. 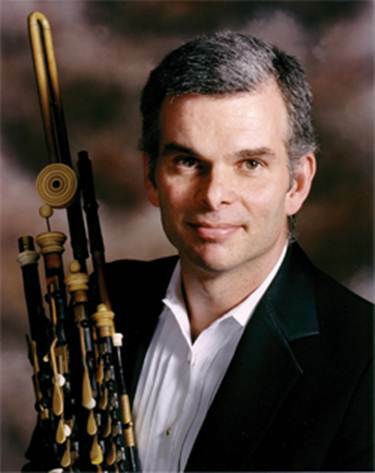 Born in New York City to an Irish-American mother and a father from Dublin, Ireland, Jerry first learned to play the Scottish highland pipes. During summer visits to family in Dublin, he learned the uilleann pipes from listening and asking questions to experienced players such as Peter Carberry, Matt Kiernan, Dan Dowd, Peter McKenna, Fergus Finnegan, Mick O’Brien, Gay McKeon, and others. In New York, uilleann piper Bill Ochs was a major help and inspiration to Jerry. Jerry O’Sullivan is a gifted ambassador of the Irish uilleann pipes, maintaining the historic traditions and melodies of the instrument while expanding its range into new genres of music and media. His mastery of the instrument, traditional knowledge, versatility, and dedication to education truly make him America’s premier uilleann piper. He is currently working on a solo recording which, he hopes, will be ready in time for the So Cal Tionól.